No matter how early I arrive at the Shenzhen-to-Hong Kong border crossing, I’m somehow always in a rush. So, as my taxi rolls into the parking garage, I pay the driver and immediately dive into the river of people headed to Hong Kong. I ignore the shops that line the concrete hallway. The clatter of footsteps and the press of those behind keep me moving. Signs point toward Immigration for visitors and, after that, to Chinese Customs (no coins to declare this time). Then come the Hong Kong checkpoints. At last, the inspections are finished and I use my Hong Kong “Octopus” metro card to pay for the long ride to Kowloon. Almost the same scene plays out in reverse from Hong Kong-to-Shenzhen, but more people pull suitcases behind them — often filled with their haul from shopping sprees. After the Opening and Reform in 1979, it took the People’s Republic of China just a few decades to build one of the world’s great economies. On the 40th anniversary, what does the future hold? Six coins recently issued by China offer an answer to that. These include four 30-gram silver examples in a boxed set that lay out a story of past, present and future. The four-coin silver set is bookended by a pair of coins that represent great expectations. In between are two coins that celebrate the country’s spectacular growth since 1979. While you might expect that with four coins and four decades, each might cover ten years, it doesn’t work like that. The coins represent stages of development, rather than spans of years. The fourth and final coin really carries the spirit of the other three forward to the next decade of the Opening and Reform. It is this fourth coin that I suspect must have been the greatest challenge to design. It shows Xiong’an New Area, a high-tech city and industrial center that is planned for Hebei Province, roughly 130 kilometers (80 miles) from Beijing. Two years ago, President Xi Jinping called for Xiong’an to be a green city that epitomizes Chinese innovation. It will be the 19th national-level new district and economic zone in China. There are estimates that as much as $580 billion total will be spent to build it, with more than $91 billion of that budgeted for high-speed rail construction. 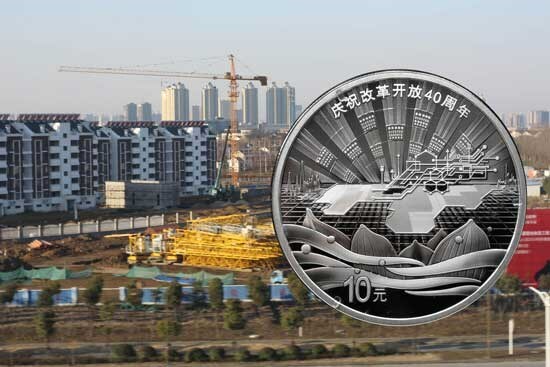 The 40th Anniversary of Opening and Reform 10 Yuan silver coin for Xiong’an New Area. It will be the 19th national-level new district and economic zone in China. The coin is one of a four-coin set. In the background is an example of city building in Jiangsu Province, China. This construction is far from complete, though. If you visit this site today, it is still in the early stages and much of the area remains in its natural state; a lotus flower-filled lake. From just this and a map, a gifted artist has created an elegant design that projects Xiong’an New Area as an exciting, state-of-the-art metropolis. The set’s middle two coins feature a pair of the greatest city-building success stories of modern times: Shenzhen Special Economic Zone and Shanghai’s Pudong New Area district. Their development stories overlap, but Shanghai represents the third stage of development as the Pudong New Area district was built later than Shenzhen. How new is it? Really new, as I learned a few years ago. In November of 2013, NGC celebrated the opening of its new Shanghai office with a symposium in Pudong New Area. On the way there, my taxi passed many office towers before it arrived at a glittering hotel. I was stunned. It felt as if a city had been poured out like instant noodles, yet everything around me was solid, permanent — the China of the past had simply shed its old skin to become the China of today and tomorrow. By now, that NGC office is the “old” office and there is a newer one. Pudong New Area keeps hitting ever-greater heights, too. At night, from across the Huangpu River, large crowds gather to thrill at its skyline. Brilliant messages traced in light crawl up and down the sides of many of the Pudong skyscrapers and put on a show that is a popular backdrop for countless photos and selfies. The most recognizable building is the 468-meter-high (1,535 feet) Oriental Pearl Tower. Its iconic shape anchors the design of the third coin in the 40th Anniversary set. The vertical lines of all the buildings give a sense of the heights to which the Opening and Reform has climbed. Another instantly recognizable landmark featured on this coin is the Nanpu Bridge. This was the first bridge in the central Shanghai area to cross the Huangpu River, a dream for Shanghainese since the 1920s. Until it opened in 1991, the only way to travel directly from Puxi to Pudong was by tunnel, or by ferry. The Nanpu Bridge’s opening accelerated Pudong New Area's development. In the coin design, the bridge’s circular interchange adds motion to the lower part of the outstanding design. 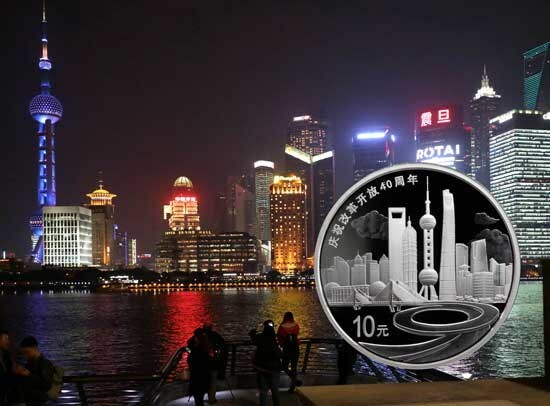 The 40th Anniversary of Opening and Reform 10 Yuan silver coin for Shanghai Pudong. This entire area has been built in the last 40 years. In the background is its famous skyline at night. 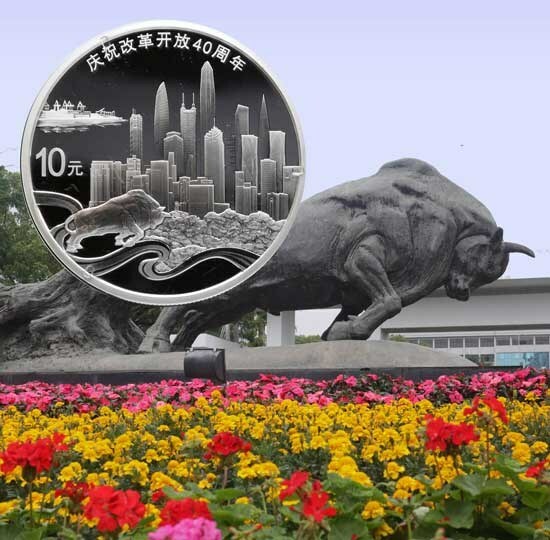 A skyline also graces the second stage coin that marks the development of Shenzhen and its Special Economic Zone. The visual elements of the Shenzhen coin reflect the rapid growth of the city. The slogan of the city builders was, “Time is money, efficiency is life.” These words are inscribed on a wall in Shekou Time Square in Shenzhen and the city’s builders took that motto to heart. The coin portrays not only the city’s height, but also its function as a port. The famous bull statue that has symbolized Shenzhen’s drive and energy since its installation in 1984 is shown, too. The 40th Anniversary of Opening and Reform 10 Yuan silver coin for Shenzhen. The statue of a charging bull is a symbol of the city's spirit and can be found in the coin design. Last – and also first – is a coin with a simple design that captures the very birth of the Opening and Reform. The wheat grains obviously symbolize an agricultural connection, but there is much more to this story. It was in Xiaogang Village, a small place in Anhui province not far from Nanjing, that 18 farmers took the first step to economic change. They signed a compact to separately manage their plots of farmland. This was a success – production jumped. 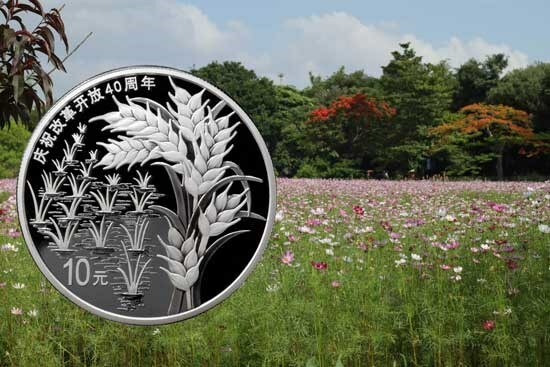 The crop was wheat, so there are 18 wheat plants on the coin to symbolize the 18 farmers who opened a door to the future. The 40th Anniversary of Opening and Reform 10 Yuan silver coin for Xiaogang Village in Anhhui Province. This village is considered a birthplace for the economic growth in China. In the background is a farmer’s field in Guangdong Province, China. The effects of the Opening and Reform are visible everywhere and to everyone in People’s Republic of China. So, take a look at the exceptional new 40th Anniversary Opening and Reform set. It takes pretty special coins to show us not just where we have been, but where we are going.